In her final journey as Guest Editor for TN, Wangüi Kamonji talks with Simon Mitambo. Simon Mitambo is a multi-faceted person working from the personal level to the continental and global level. He has undertaken a personal journey of reconnection to nature and culture and from it initiated projects in his home village, while he co-ordinates a continental network for cultural and biodiversity. I met with him to find out what animates his work and life. You are the coordinator of the Africa Biodiversity Network (ABN), you run the Society for Alternative Learning and Transformation (SALT), you participated in the inaugural Earth Jurisprudence programme, and you just founded a school in your home village. This is quite a lot, what links these 4 things you are engaged in? I’d like to start by sharing where all of this comes from. ABN is a regional network of individuals and organisations working to protect natural systems. Our vision is around communities that are rooted in their own biological, cultural and natural systems, and living in harmony with nature. In this modern society, people have been very disconnected from the environment, and this is causing some of the problems of today: climate change, environmental destruction and so on. I like giving the example that we humans can behave like cancerous cells. Working out of a disconnection from nature, as if we are separate from other natural aspects is similar to when cells stop communicating with the whole system. So ABN’s philosophy and work is about connecting people back with nature. And it is from this connection that we have better care for our planet which becomes part and parcel of our existence. Our planet, plants, animals stop being ‘natural resources’ delivering ‘ecosystem services’. 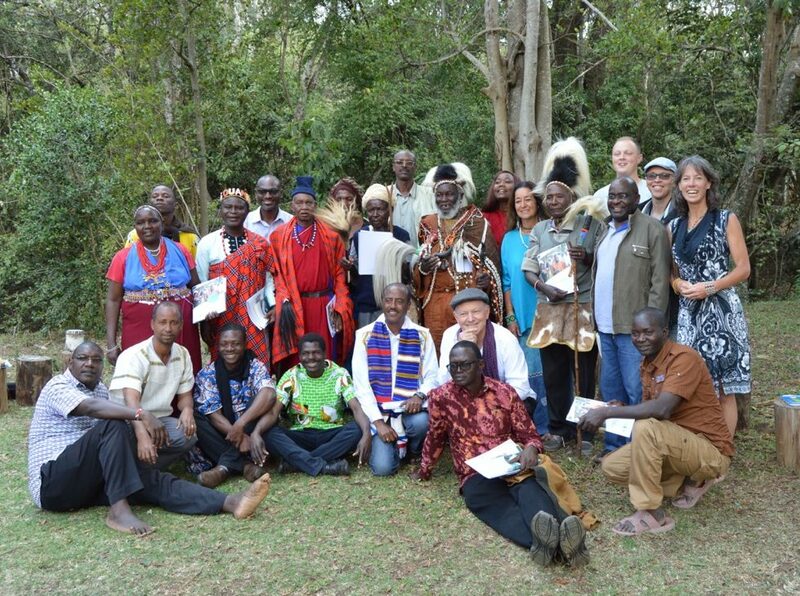 At the moment ABN, in collaboration with the GAIA foundation have been running a 3-year course on Earth Jurisprudence and the first batch of EJ practitioners graduated in 2017 at a colourful initiation ceremony in Mount Kenya, and a new team came on board who will take forward this kind of thinking. What is the society for alternative learning and transformation? You might say the alternative is the original because in SALT we learn the way people originally learnt. With the current conventional understanding, it seems like something new because this has been lost. We learn through methods like learning under a tree, with community dialogues, telling stories of origins, where we have come from, getting to know how we relate with our land, all these are alternative ways of learning. Learning like this means that we have also to transform our mindset and perspective of how we see certain things. For example, elders are our resource people for this kind of learning. And they have never been to school, but they are very eco-literate. These are the people who we in the modern society look at as illiterate and people who don’t know anything. 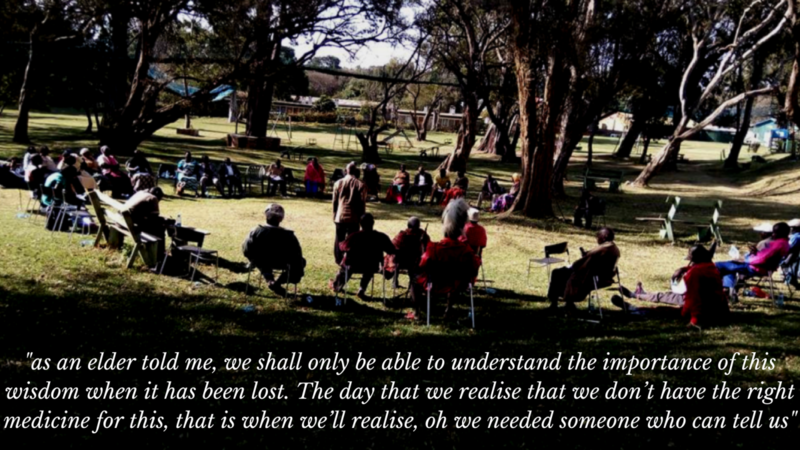 So in SALT we bring elders to a space where they feel they know something, and they have a story to tell and they can be appreciated. Which is something which comes from a mind that has been transformed. Every time we get a problem we want to go to the specialist. Elders are traditional knowledge holders and they can inform our knowledge and practice. So this is SALT’s mandate: to bring back traditional knowledge, to teach it in a way that’s captivating, and in a way that connects. 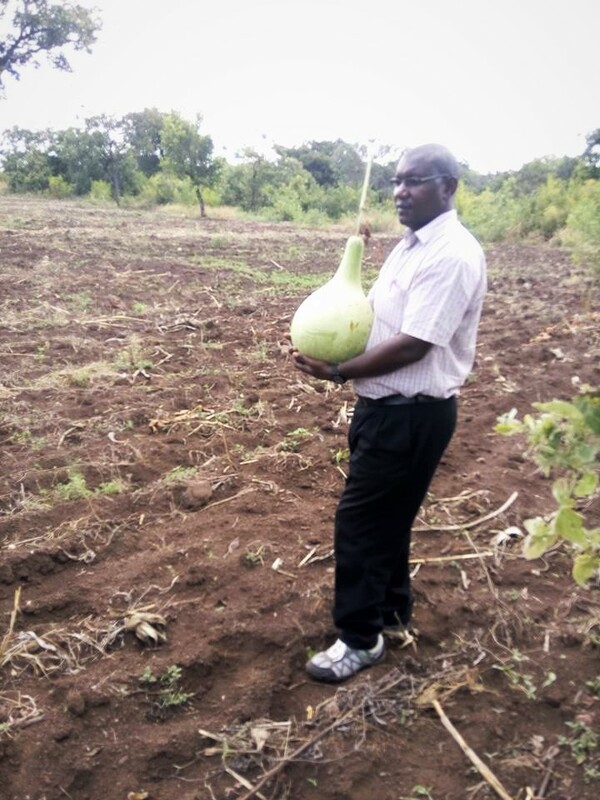 At the moment, we work with communities in Tharaka and are expanding to Mbeere. We are using the traditional systems like clans to bring back this knowledge. It is very contextual in the sense that, in Tharaka, clans are very vital because it is through clans that you define your relationship with yourself, with other people, and with the land where you’re living. So as SALT we chose to work with traditional governance systems. SALT is also part of my personal journey to understand who I am and my cultural identity. I call it going back to root. It is important to understand who you are so that as you work with other communities you have an authority to say, this is where I come from, this is how we do things. It is from that perspective that you get to understand how other diverse African cultures work. It is by understanding who I am that I am able to understand how the other person is different or similar to me. And that’s how we build tolerance. What is the importance of working through traditional governance structures? Since we began SALT in 2013, we have not had any external donors. What we have been doing is to tap into how clans operate. The first thing is that we invoke the mandate of that institution. When the clan calls a meeting, usually it’s the members who are responsible for what they’re going to eat. Members bring food. Members bring everything that they’re going to do. So you invoke that level of responsibility, and then the whole system can be self-supporting. And our agenda is not defined. It emerges from the discussions that happen. Mostly we start with introductions which are very deep, and then from there, we begin to weave our stories. And through those stories, through those community dialogues, there are things that we discovered that we have lost and that we need to bring back: our traditional food, our traditional seed, etc. Members then began to look for those seeds, and they came back and shared. They also go and practice what we discuss. My experience in this work is that it is very much about knowledge and practice. We have to develop some personal practice to be able to understand this work. It is not just about reading from the books but very much about how do you translate that into a personal practice and from that you become a change agent. When we use the right structure, it has power in how we work. If we say we are coming for a clan meeting, everyone understands how clan meetings operate. We don’t wait for people from outside to bring us food. If members don’t bring what to eat then they already know they are failing. They don’t need anyone to tell them that. So by invoking these traditional governance structures, we have been able to work. We are also not leaving any stone unturned. We know that the education system currently in schools plays a large role in shaping our mindsets. This is why I started Kithino Learning Centre. Although it is implementing the conventional curriculum, we are teaching children in a way that excites creativity and curiosity, and much of this is through learning in nature. We have set up the school embedded in a natural system where the kids learn from outside. We know that there is a lot of power in nature, in terms of creating the levels of learning. It’s a school that is inspired by learning outside of the box, not the way we were schooled – to sit in class, and when something does not happen the way we have learnt, then it is not the right thing. 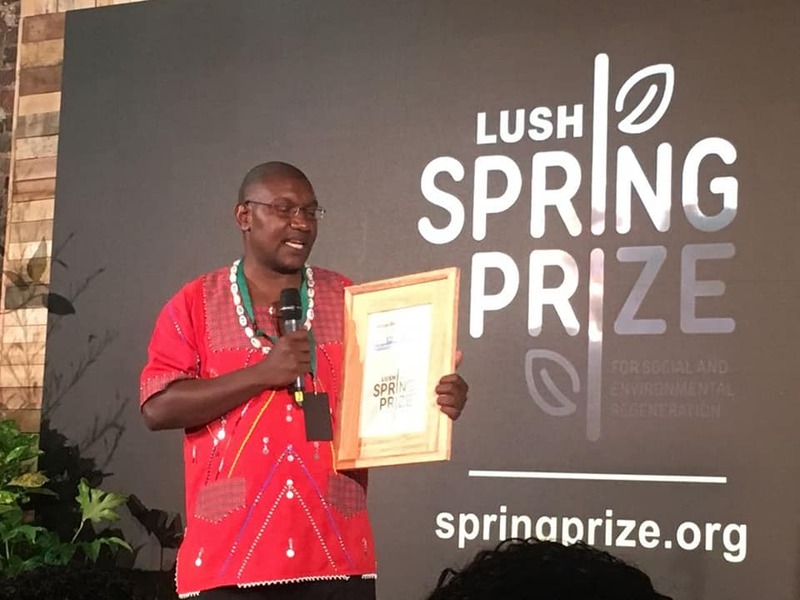 Kithino blends conventional learning with other ways of connecting with and learning with nature. At the moment we have a culture and nature club that spearheads this kind of interest. We also link with SALT because some elders from SALT come to give stories to the young people. We do nature trips and then go and listen to the stories about that ecosystem. That is how I work with and how I relate my work at the personal level with my community, in SALT, and how I am trying to influence thinking by beginning a school. Have you encountered any challenges along this path? Perhaps more than necessary. First of all at a personal level, when people see you having gone through the education system then sitting under a tree, on stones with elders, they see you as someone who is not normal. In fact, many times people have called me sorcerer and bad things like that. This path I have chosen requires a lot of confidence to explain what I am talking about because there can be misconceptions about the kind of work we are doing with elders. When you talk about indigenous knowledge, when you talk about these stories they weave in issues of spirituality, and these face the challenge of foreign religions that may feel threatened. Articulation is very important because there is a way you can do it wrongly and then it can backfire. There are also certain places where finances are required. For example, some of the sacred sites that the community wants to reclaim have been grabbed by elites. Sometimes this requires travel to the lands registrar or legal fees, much of which comes from our own pockets. And sometimes you cannot support such claims all the way through. There are many many things that we can do without funds but there are certain things for which we require funding, and at the moment we do not have it. What are some successes along the path? Successes are many. ABN is the only organisation in Africa that is advancing the call for people to connect back to their nature and culture. As far as I know in Africa, it is the ABN approach that is working. From that we have seen a lot of people take better care of, and deepen relationships with nature. And that change of worldview, the relationship where you see environment, natural systems as being part of who you are, begins to govern your actions. Through our processes and methodologies we have seen many people change and become change agents. For example, organisations like MELCA Ethiopia, Institute for Culture and Ecology, EarthLore, SALT and others have begun because of individuals who have gone through the ABN process, and gone back to their communities to mobilise them to relate to nature and their culture again. There are a lot of things that these organisations are doing to revive traditional food systems by way of understanding their seasonal calendars and reviving those traditional seeds that resonated with our ecological zones. This has restored diversity of food crops, including restoring the input of wild foods in diets. People survive better than when you are looking upon one crop only which may be wiped out if a disease comes. In doing all of this work, you’ve mentioned some very personal challenges. How do you take care of yourself to manage to keep going? I think what drives me is my conviction. I’ve gone through the Western education system, which schooled me to think a certain way. However, when I came to understand that there is another way of knowing things, through tapping into our traditions and traditional wisdom, I’ve noticed that I can live better with the two ways than when I confine myself to one. When you have a diverse connection of ideas, you survive better than when you know only one thing. Again, I also came to learn that when I am able to define who I am, I am able to relate to other people better. And by reviving diversity there is a higher level of survival. So these are some of the things that drive me. And then there is a natural passion. I find this work is interesting, it is more involving, it is challenging, you know. And every day there is learning, unlearning and relearning of new things. We are losing a lot of this knowledge and so I have the motivation to learn more and more so that at least we don’t lose this wisdom. What’s your vision for Kenya’s environment? There are very many challenges in Kenya and we have had cases where we have suffered some catastrophes because of our disconnection from nature. I am hoping we get to understand that nature is not there just for us to enjoy. It is for us also to be embedded in nature. I think there is a lot of hope with the ongoing work of organisations with this philosophy. We have even seen cases where even the government is tapping into traditional wisdom by involving elders in handling disputes for example. My plan is to build institutions that can bring change at the community level, like the way SALT works to rebuild traditional governance systems, and to reschool our schooling system so that we connect with ourselves and with our natural systems. When we institutionalise these things, more people can engage with them. We need people who can tell more of these stories. We need people who can listen to these voices. So what I can say is that there is a lot of prospects in this wisdom and this is where we can find our homegrown solutions to challenges we face. Environment to me is what I am also part of. When I begin to look at environment I see trees, I see plants, I see animals, I see natural reality and this is what defines me. It is not something that is different. Sometimes when we talk of environment, it’s like the trees are there and we are here. But it is very much about who we are. It is what surrounds us, how we relate with it, how we can learn through the interaction with it. So you’re also reciprocating. You’re also not seeing yourself as a beneficiary of what there is in the environment but you’re part and parcel of that natural system within which you have to resonate. Within which you have to develop a relationship with each aspect. That is the environment.